NuForm™ offers the option to prep and pamper yourself non-surgically with little to no downtime! Combines the deep radiant power of Venus Viva for the face and neck. 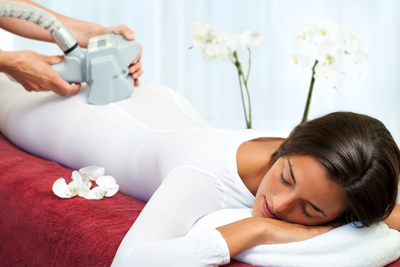 Magnetic pulses and radio frequency power of Venus Freeze for any area of the body. Lymphatic massage and tissue soothing application of Endermologie. Plus chilling collagen enhancing Cryotherapy. Are you looking to get Red Carpet Ready? Beautologie has an amazing NU treatment that may just be right for you! NuForm™ combines four state of the art modalities to deliver you stunning results from head to toe. 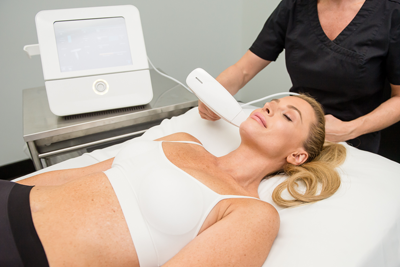 With little to no downtime, NuForm™ incorporates the deep radiant power of Venus Viva™, with the magnetic pulses and the radio frequency of Venus Freeze™, along with lymphatic massage and tissue smoothing application of Endermologie together with the chilling collagen enhancing Cryotherapy! First, we start with the face and neck to deliver nano-fractioned radio frequency waves deep into the dermal layer of the skin. These energy pulses literally wake up your collagen production! Our goal is to tighten the lax skin of the face and neck to give you an astounding new glow. Venus Viva™ works to smooth lines and wrinkles, improve the jowls, tighten the eyelids, also firm the neck altogether. It can also help even out skin tone and texture by improving pores, acne scars, and sun damage. We will ensure your treatment is as comfortable as possible by applying a topical numbing cream enhanced with facial cooling which allows for discomfort to be at a minimum. Within just a few short days patients will see a marked improvement of their skin. The healthy new glow will begin to shine through! Thereafter we begin with the second part of the treatment with our highly sought after Venus Freeze™ treatment! Venus Freeze™ combines the power of magnetic pulses and multipolar radiofrequency to not only tighten skin but also shrink fat cells. Whether it is a little loose skin around the belly one wants to firm up, or a waistline that needs to be trimmed, a bra-role that has been a problem area, or even buttocks that need a little lift, the Venus Freeze™ is versatile enough to target any one of these areas. Simply discuss with your practitioner which area concerns you and we will concentrate on giving you the desired results you are looking for. We then have you change into an Endermologie® suit which provides the maximum benefit and comfort for the third part of the treatment. Endermologie® is a time tested technology that improves cellulite, firms the skin, provides lymphatic drainage and helps to contour the body. The mechanical stimulation provided by the patented LPG Endermologie® device helps to further reactive your collagen and break down fatty adhesions that cause the orange peel texture in the skin. In fact, some patients describe the sensations as a deep tissue massage! Finally, if you have any retained heat, areas that need a little more work or you just need a great pick me up - we finish your treatment with an invigorating Cryotherapy Facial. This helps to detox and rejuvenate the skin. Patients see a restored firmness immediately after the treatment. 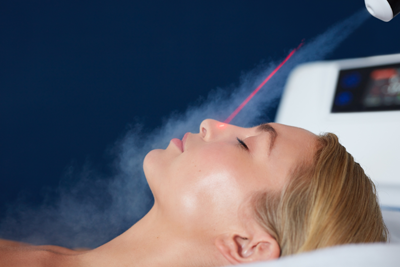 The Cryotherapy Facial will also soothe inflammation plus improve pore size and skin texture. With NuForm™ you will be sure to be Red Carpet Ready! If you are looking to improve the fit of your amazing new dress or achieve a flawless complexion you have dreamed of, NuForm™ treatments will help you obtain that desire! Patients have the option to come in for a series of treatments to maximize their results or if looking for a quick boost for an event the combination of the four power-packed modalities will provide maximum benefit in the shortest amount of time! Meet with one of our aesthetic providers at Beautologie to discover if NuForm™ is right for you!